Hogan’s Heroes was a 1960’s sitcom about U.S. POWs in a German prison camp. The two bumbling leaders of the camp were Colonel Klink and Sergeant Schultz while the shows namesake was Colonel Hogan a U.S. Airman. It was fun show that also ran on Nick at Night when I was a kid. My understanding is the show holds a special spot in the hearts of many historical gamers, so it makes sense that somebody would do tribute models for them. Painting is my standard recipe for the grays, browns and greens. 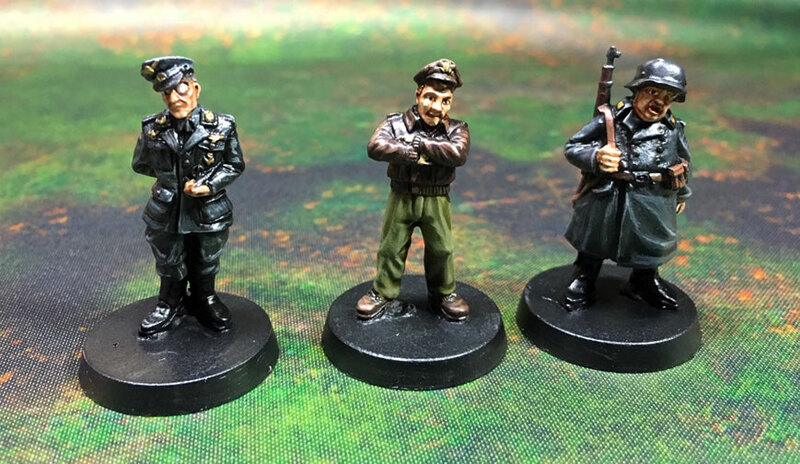 Because these are center piece models they have a few extra levels of highlights and shades to make them stand out from the rest of the sea of greens, browns and blacks that are standard for most WWII forces.